Most do not believe that you are capable,to sue Alaska OCS,the agency and or individual worker,for the violation,and clear destruction that has darken your once happy beloved family. ask for specifically ext. 102 AFTER help-form has been implemented. When (effective teachings,research,STEADY focus,and empowerment engrained within yourself to be timely applied. #EDUCATION_IS_KEY as self-taught so learn the law today(you are more than capable)despite nay sayers,"cps"who think you are not smart to do so,learn as much as you can as the founder has,and her family,LEARN! DO NOT GIVE UP, when you are violated. YOU ARE DEFINITELY CAPABLE,in order to hold those accountable at OCS,for the harm,the clear-act(s)of wrongful;the gross-negligent acts that has harmed you and the most beautiful precious part of your days,and nights,and that is your child,grandchild. Owner,S.Melendez,Bella, ext. 102/260 knew what to do,and has done so timely,by her deadline.She is lauded by lawyers across the nation for such on her own known as pro-se,as her entire family. 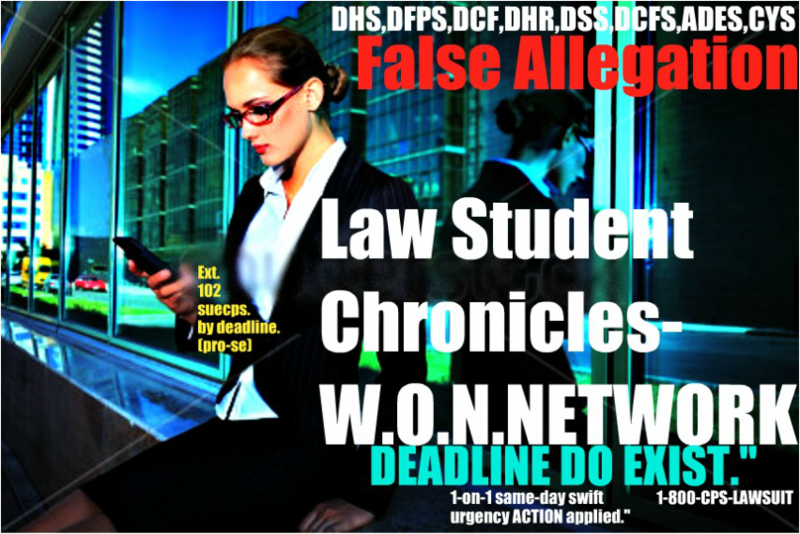 We,here at W.O.N.Bella's network(lawstudentchronicles.org) have been exactly where you are,and hence the reason we have mastered in command,what we knew all along was warranted,and shall continue to through our chat,sessions,week-by-week protest,our EFFECTIVE- 1 of a kind ctr, our nationwide HELP-hotline-via e-chat,via email(s)through phone-in,SKYPE conference(s)with multiple lawyers of interest,from california to texas,to nj,pa,nj tri-state,nationwide,michigan florida,nationwide,U.S.A.,and those who are like her,suing known as pro-se self file CPS to bring real change. OCS in Alaska,HAS HARMED MANY. and that is relevant to doing so,in one word>>>> TIMELY." She realize what was going on,and her injury,violations,as her girl,speak volumes,to many daily. She did not give in. No one protected them,"after" they were sadly removed,during a "weekend holiday visit. "Never returned,until completely harmed,damaged,for some time,subjected to CPS well-known CPS abuse neglect,and as a result,she file and her family PRO-SE self file. Inspiration for many from your state,and nationwide. If you and your family are being mistreated,continually violated? "Alaska OCS have been sued." to your family by DEADLINE." Your civil rights do matter, despite what false allegations against you OCS worker has filed against you. 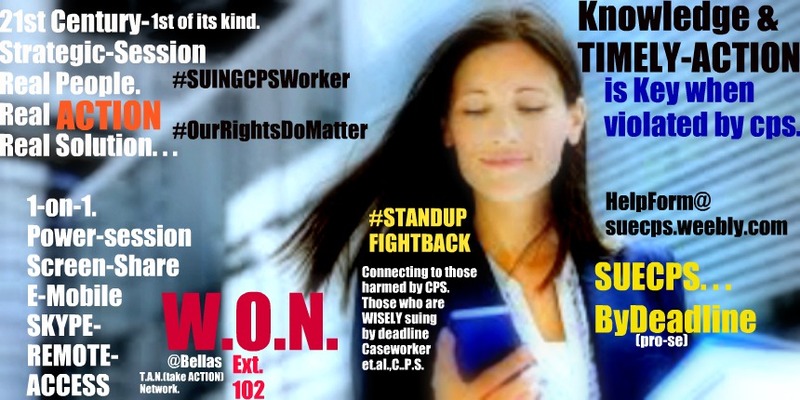 You are able to sue pro-se self file when harmed by CPS worker. As well as your child.As case law wholly support per state,U.S.A.nationwide. Martin Luther King Jr.,made such crystal clear,as his message is still ringing'in our heads,at each protest,each fight for what is right,universal,and you must remember that,when you are being as the founder,girls,and the founder was.so gruesomely mistreated. Time is limited to sue,as any lawyer will agree. Hence do not procrastinate when you are in the right,and was injured by cps worker. Such urgency-action today,before you LOSE your chance,to sue the worker who is responsible,per workers,you are seeking to hold rightfully so accountable lawfully,in a timely manner.